Home > Radical Islam, Theology and Eschatology	> The “Perfect Human Being”: Can An Islamic Antichrist Present Himself As God And Receive Worship, Yet Remain A Servant Of ‘Allah’? The “Perfect Human Being”: Can An Islamic Antichrist Present Himself As God And Receive Worship, Yet Remain A Servant Of ‘Allah’? The world of Biblical eschatology has undergone a major shift over the past few years. Many discerning Christians now recognize immediately this “Islamic messiah” as a prime candidate for the Biblical Antichrist. But despite all that has happened and continues to happen in the Muslim world as of late, there are still many others who continue to resist any notion that Islam is the religious ideology of the Beast in Daniel and Revelation and that the Biblical Antichrist could be a Muslim or be associated with Islam in any way. In their way of thinking, the argument always begins with the premiss that the Antichrist will be someone who will literally announce to the world that “I am God” and will then demand to be worshipped as God. Since no Muslim would ever dare claim to be God (under accusation of blasphemy and penalty of death) and since no Muslim would ever dare to worship a mere man who made such a claim (under accusation of blasphemy and penalty of death), Islam must, they believe, either be all but destroyed before a non-Islamic Antichrist comes to power or undergo a significant theological metamorphosis, making it virtually unrecognizable to the Islam that we have today. But there is something very significant that many are missing, and it involves the premisses upon which their conclusion is derived. When someone assumes even one or two false premisses as true, the wrong conclusion will more often than not be the end result. And the belief that the Antichrist must say “I am God” is one example in particular. One of the claims often argued by Muslim apologists against the Christian belief in the Deity of Christ is that Jesus never said “I am God” anywhere in Scripture. And they are right. Jesus never said to the Sanhedrin, “I am God.” But there is something pivotal in the Biblical texts that Muslim thinkers either overlook or have chosen to willingly ignore entirely. Healing the sick and raising the dead to life notwithstanding, Jesus accepted worship — something that must be reserved for God alone (Matt. 28:9). Jesus forgave sins (Mark 2:5-7) — something that only God can do. Jesus declared that “before Abraham was, I AM” (John 8:54-58), effectively presenting Himself as the God of Israel in front of Jewish religious leaders. Jesus affirmed that He was the Messiah (Mark 14:60-62) who, according to Jeremiah 23:5-6, was to be the Lord God Himself and claimed to be the “Son of Man” dozens of times who, according to Daniel 7:13-14, was to be the eternal Ruler of an everlasting kingdom. Make no mistake about it. If someone who did not know the Hebrew Scriptures was present to see and hear Jesus, they would not have understood the theological significance of what Jesus did and said and would have probably given it no second thought. The Jewish religious leaders of His day, however, understood the theological significance of His actions and words immediately and sought to kill Him for “making Himself equal with God” (John 5:18). With this in mind, let’s now turn our focus to the words of the Apostle Paul who, in 2 Thessalonians 2:4, wrote that the man of sin or lawlessness would one day somehow claim to be God. According to Biblical Scripture, anyone claiming to be the “intercessor” between man and God or the “savior” of humanity returning to usher in global peace and justice would be attributing to himself titles or positions that is exclusive to God alone. He would be showing himself to be God. To a Muslim’s way of thinking, however, this is not the case at all since Islamic jurisprudence is based upon Islamic texts, not upon the Hebrew/Greek Scriptures of the Bible. “Savior” is not one of the 99 names of Allah in the Qur’an and there is no need for a Divine intercessor between man and God like there is in the Judeo-Christian Scriptures, thus attributing such titles to an Islamic leader would in no way, shape or form be a declaration of divinity in the Muslim mind. As we can see, claiming to be God does not therefore necessitate that the words “I am God” be spoken in order to make it a true declaration. Jesus attributed Divine functions and titles to Himself that could only to be attributable to the Almighty or His office and, as such, showed Himself to be God — distinct from the Father (John 14:23) and yet one with the Father (John 10:30). Conversely, when Antichrist shows himself to be God, he will do so in such a way that Jews and Christians will be able to recognize it immediately, but those who believe the lie will not. The elect will not be deceived (cf. Matthew 24:24). While accepting or claiming the position of “savior” and “intercessor” on one hand, a Muslim Antichrist would easily deny any accusation that he is claiming to be God on the other. In the eyes of the God of Israel, however, this is precisely what he would be doing. Does The Prophet Daniel Tell Us That Antichrist Will Exalt Himself Above Every God, Including Allah? Context is key. Daniel clearly shows us in vs 36-37 that Antichrist will speak blasphemies against the God of gods, will pay absolutely no homage to the God of his fathers, and infers that he will “exalt himself, and magnify himself above every god.” However, Daniel then makes one exception. In vs 38-39 he introduces us to the one god that Antichrist does not elevate himself above, stating, “But in his estate shall he honour the God of forces … a god whom his fathers knew not shall he honour … a strange god, whom he shall acknowledge [and] increase with glory.” This is the god that Antichrist will not exalt himself over, one that would be familiar to him, but not one that would be familiar to his fathers, Abraham and Ishmael. Obviously, Antichrist cannot honour his god and increase him with glory if he believes that he is god [Allah] or that he is above him. That would be nonsensical. Daniel 11:36-39 is not only a perfect description of how Islam operates as a religion, but is also a perfect description of what Islam is. An Islamic Antichrist will exalt himself over every faith and belief system that exists or has existed outside of his estate (H3653 ken — base, estate, office), outside of the religious ideology that the “seat of the beast” forces upon everyone under its control. Antichrist (and by direct implication the one whom he represents, Satan) will position himself against everything called god or considered God or divine outside of his base/estate/office. He will exalt himself over Ayyavazhi. Over Buddhism. He will exalt himself over the gods of Hinduism and each and every single one of its sects or denominations. He will exalt himself over Manichaeism. Over Mithraism. Over Zoroastrianism. Over Confucianism. Over every Shinto sect and school of thought. Over every indigenous religion that exists or has existed in the Americas, in Eurasia, in Africa, in Oceania or elsewhere. He will even exalt himself over the One True God of gods — the God of his fathers — over Adonai, over Mashiach, over Ruach ha Qodesh. He exalts himself over them all by attributing to himself a Divine Title or Function held only by YHWH, and by definition therefore declaring himself to be the God of gods. The Islamic world accepting the Mahdi as their “savior” or the “intercessor” between Muslims and God will make this man to be “Christ” (the word “anti” doesn’t just mean against, it also means in place of) and is blatant idolatry and blasphemy in the eyes of God, effectively calling YHWH and His Messiah a liar. This is all a part of the deception that is Islam. Consider for a moment Islamic behaviour and teachings in light of Biblical revelation. On one hand, Islam convinces Muslims that they must not worship idols, yet on the other hand it commands them to kill anyone who says or does anything negative to the Qur’an, and to be willing to die for it. It commands them to kill anyone who says anything negative about Mohammed, and to be willing to die for their prophet. It causes them to bow down facing Mecca five times a day where the Black Stone (Kaaba) sits, even teaching them that touching the Kaaba absolves them of sin(!). 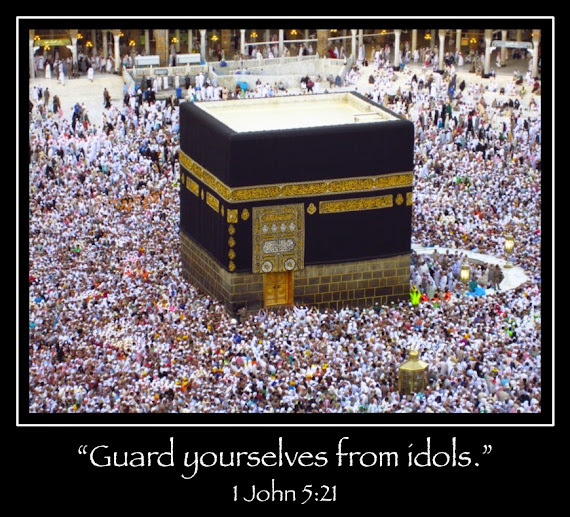 They will gladly offer their lives for every one of these, each of which is blatant idolatry in the eyes of YHWH because it is worship of the Qur’an, of their “prophet”, of the Black Stone, of their “savior.” It is worshipping the image of the Beast. More Than Just A Man? There is also one final point that needs to be considered as well with respect to the “man of sin”. We should not discount the possibility that the “man of sin” may not be pointing to one single person as it were, though the general consensus is precisely that, but could instead be pointing to one single entity or system. The Ekklesia of God is comprised of a great multitude of believing Jews and Gentiles created as “one new man” in Christ who are marked by God (Eph. 2:15, Rev. 14:1) and described by John in Revelation 7 as the “multitude of the lamb”, ie, Jesus Christ. Conversely, the “man of sin” (2 Thess 2:3) could therefore be its direct antithesis comprised of those who have the Mark of the Beast and described by John in Revelation 13 as the “multitude of a man”, ie, the “prophet Mohammed”. If this is the case, then we may be even closer to the cusp of prophetic fulfillment than many of us realize. In this light, the Holy Spirit could very well have been referring to the “man of sin” or “lawlessness” as the Ummah of Islam which stands against the temple of God, essentially displaying itself as God by usurping the Divine title/office/way of Salvation in claiming that salvation is only found in “Allah and His Messenger” and not in YHWH and His Messiah. And, sure enough, the Ummah of Islam stands against the temple of God and does this very thing today, blaspheming the God of our Salvation and boastfully declaring that “Jews and the Christians are enemies of the [Islamic] believers” who are “cursed” because “adhering to Islam is the only path to enter heaven, and escape hellfire” . Whether Antichrist is a man or a system, we may indeed be even closer to the cusp of prophetic fulfillment than many of us realize. Islam is directly influenced, controlled and is even being given its authority by Satan himself. I think most of us would agree. Lately, however, Islam has been strengthening considerably in its authoritative influence, and may even strengthen militarily if/when Iran reaches nuclear capability. But it is more than just a violent religion that hates everything outside of its own ideology. It is Satan’s platform upon which he is attempting to exalt himself and become like the God of Heaven. It is a means to an end. * Yahweh has the Ekklesia (The congregation of God, the true Church). * Satan has the Ummah (The congregation of Allah, an apostate Church). * Yahweh has given the Ekklesia His Word, the Word of God, the Holy Bible. * Satan has given the Ummah its corruption, the “Word of Allah”, the “Holy” Qur’an. * Satan’s Ummah is like a harlot “decked with gold and precious stones and pearls” and filled with abominations. * Yahweh’s Ekklesia is the multitude of the Lamb — Jesus the Messiah — whom they follow. * Satan’s Ummah is the multitude of a man — Mohammed the “prophet” — whom they follow. * Yahweh’s Ekklesia comes out of Great Tribulation. * Satan’s Ummah is responsible for it. * Yahweh’s Ekklesia receives the seal of God upon their foreheads and are redeemed. * Satan’s Ummah receives the Mark of the Beast upon their foreheads and are condemned. * Yahweh’s Ekklesia will be lead to springs of living waters. * Satan’s Ummah will drink of the wine of the wrath of God. To borrow the analogy from the concluding remarks made in the Revelation 13 commentary, the stage has been set. In the “theatre” of Biblical eschatology, it is ready for the final act. All “props” are in position. The “characters” are in full costume. And the world is watching in attendance. Very soon we will witness the final act begin, and through Islam Satan will make his final stand against the Prince of princes. Excellent ICA! I would like to print and send to my father who is teaching a class on Revelation. I don’t know how anyone cannot recognize what’s happening. But yet they don’t. Time is running out, I fear for those in the valley of decision. I pray for them to turn to Jesus, while there is still time. I do not know if you have ever made the connection, but it is very interesting to consider that in 2015, it will be the 70th UN General Assembly! We also know what happens this particular year: solar and Lunar Eclipses falling on biblical Feasts (a solar eclipse on the Feast of Trumpets, on September 13, and a lunar eclipse on the Feast of Tabernacles, on September 28, 2015). The number 70 represents the “nations”. I do not know the dates of the 70th UN General Assembly yet, but I would be ready to bet that they will coïncide with the above Moedim (YHVH appointed times)!!! Ahmadinejad’s speech yesterday fell on YHVH’s 6th Biblical Feast, Yom Akkippurim (a Feast associated with the expiation of Israel and the nations). With Ahmadinejad’s speech about the imminent return of the Mahdi, it will be very interesting to see how the next 3 years unfold! Good reasons given that the Mahdi will be the Antichrist. But of course he has not arrived yet. Ahmedinejad has been talking about this for years now and no Saviour is appearing on the Islamic front. Iran itself is in a state of distress – the only way the Islamic regime clings on to power is through brutal suppression of their opponents. Most Iranians are sick of Islam and would love to live in a non-Islamic regime. Ayatollah Khamenei (who also preaches the Mahdi coming) is widely despised as a corrupt wicked old despot. And Ahmedinejad’s version of events is a Shiite one while the majority in the Middle East are Sunni Muslims (most of whom hate and reject Shiites). Sunnis too look for the Mahdi to come but at the moment there is no one to inspire much confidence in the arrival of an Islamic Saviour from the so-called Arab Spring. I suppose if someone could unite them to bring about the destruction of Israel that might be seen as the Mahdi, but then the prophetic scriptures show Israel surviving (albeit facing elimination) until the coming of the Lord to the earth. Also the question of whether there will be a peace / covenant with Israel signed by the Antichrist remains. The Ahmedinejad version is one of destruction of Israel. Hi Tony, thank you for your comment. With respect to there being any sort of peace treaty signed by the Antichrist, please feel free to read through this article for your consideration. Thanks for the excellent post ICA, and for giving permission to copy/print anything. I am just now easing my friends and family into end times issues from the Islamic end times perspective. I’m preparing a series of 30 FB posts, one for each day of the month showing evidence from the Bible and from history that the anti-Christ will be Islamic in origin, being revealed today and emphasizing the need for repentance and belief on Jesus Christ (which, following the model of Revelation, should be the underlying reason for all of our studying of end times). Though I’m trying to be as original and self-studied as possible, using multiple sources, your material will be a great help. A wonderful opening to knowing the times we live in. In conformity to GOD’S Word, I personally was shown a vision of how the whole world will go through the test of – Islam- its show of earthly wealth against the Living Word of Truth in Christ Jesus. And sadly the quest for silver / gold had drawn the Church away from this understanding. Wow…..this Hit the nail on the head!!!!!! Thank you for your hard work and allowing us to reproduce!!!!!! Maranatha!!!!!!! I picked little gem up from a user on The Blaze.. I don’t know if you have seen it or not. I had not seen it until today. Thanks. A lot of good hystorical info. Thank you for the kind words and encouragement sandollarlady. I am humbled and blessed to know that the blog is making a difference. May our Heavenly Father bless you and your husband. It is simply amazing that the world ignores the history of the many nations that have tried to destroy the Jewish people. The Egyptians, Canaanites, Assyrians, Babylonians, Persians, Greeks, Romans, Spaniah, English, Germans, Ottomans, Arabs, Islam, the UN, and how many others, the burial list for the nations, peoples, tribes that the Jewish people buried through history continues on. God Bless you and your husband sanddollarlady. Thanks Kurt and ICA I’m sharing on facebook and in print as fast as I can. I think we need to pay attention and pay attention NOW, and I’m praying for more to come closer to our Lord. God Bless all. Yeah, it sure seems to be falling into place…I used to be into escatology but took a healthy break for a while. Never considered Islam a main component, but if you consider “a form of godliness w/o actual faith in God”, not to mention the obsessive beheading…it really does fit the bill. COEXIST–these poor suckers have no clue what’s heading their way, and with our currant “Manchurion candidate” in charge, it could possibly be in America too; there may even be a susspended election…by executive order. We’ll see soon enough. Great article, brings a lot of things into a solid biblical perspective. I added a new section called “More Than Just A Man?” to the article above since there was one other consideration that I felt was important to keep in mind. Whether we view Antichrist in terms of a system or in terms of a man it is important to be aware of an alternate view. If while John was alive he could say “many antichrists have appeared”, then think how many have appeared over the ensuing centuries. While there might be a “super antichrist” to come, there’s been many horrible ones already. Father may we keep our hands to the plow until the return of Yeshua, whether or not someone comes along with his jersey emblazoned with “#1, THE Antichrist”, Amen. Thank you bro ICA. This is rather coincidental, since I am in the middle of a series of posts on FB entitled “Evidence Of The Day of an Islamic Anti-Christ”. The post I have been preparing for most of the day is based on Daniel 8:25, and details the last 5 UN speeches by Ahmadinejad, exposing the anti-christ elements and omissions, and linking that to the type of deception of the future Islamic anti-christ yet to come, only that deception will be more effective than Ahmadinejads. Again, thanks for your ministry and GOD bless you and yours. I was just listening to Kerby Anderson’s recent interview of Joel Richardson on “Point of View” and noticed that Joel also touches upon this topic briefly during the interview here at about the 32:00 mark. Thanks willard. Erdogen must be getting impatient. Will be interesting to see how this plays out. I’ll share the link. Hi shah, thank you for your comment. The problem with what you are saying, however, is that the article does not manipulate Islam. It exposes it. On the other hand, Islam has manipulated the teachings of the Bible and assimilated many distortions and half-truths into its own teachings. I understand that you will disagree, but you disagree not because you have the truth, but rather because you have been taught to believe the distortions that have been assimilated into Islam and to accept all of them as completely valid and free from error. Allow me to explain what is happening. Islamic eschatology teaches that the Messiah of the Jews will be the “false messiah”, the Islamic version of the Bible’s “Antichrist” whom they call “ad Dajjal” or “al Masiikh”. Muslims are told that they, along with “al Mahdi”, must fight against this “false messiah of the Jews”. What Islam has done is flip-flop who Jesus and the Antichrist are and have made evil into good, and good into evil. Islam views al Mahdi as the savior of humanity, when the fact of the matter is that he will be Antichrist, and Islam views the Messiah of the Jews as the Antichrist, when in fact He is God in the flesh. When Al-Mahdi reach back in Jerusalem, he will not be able to defeat the anti-christ, (He seems to have strong magical powers)” (Source). Islam has already deceived the Ummah into believing that the Jesus of the Bible (the Messiah of the Jews) is their Antichrist (Dajjal) whom they must fight against, and has deceived the Ummah into believing that the Antichrist of the Bible is their Islamic savior. God Himself declares “I, even I, am the LORD, And besides Me there is no savior” (Isa 43:11). Anyone who declares himself to be al Mahdi and the savior is declaring himself to be God. [Al-Mahdi] is from the family of the Holy Prophet, and when he comes the earth will be filled with justice, and Jesus, upon whom be veneration and peace, will follow him and assist him in the slaying of al masiikh often referred to as ad-dajal – the lying, false messiah, the anti-Christ…” (Source). According to Islam, Jesus is just a prophet only. The Islamic Jesus is therefore not the same Jesus of the Bible. The Islamic Jesus is an imposter. He is a false prophet. Shah, if there is one thing I want to leave you with, it is this: Do not be deceived. Qur’an: Sura 3:54, 8:30: Allah is the best deceiver. Bible: Revelation 12:9: Satan is the deceiver of the whole world. Hello ICA, I would like to add to your accurate list of who is the antichrist, two more things, which must also be considered as antichrist. The Communists and the antifascist movement in europe persecute and insult christians nowadays! In bible it was somewhere mentioned that the antichrist will persecute true believers of christ! Another system which must be called as antichristianism, is the worship of mammon. People who would destroy or do anything to get profits nad money, they would even persecute and destroy christian tempels for money…You know what this mean…? ICA excellent post (and very informative and sincere reply to Shah). A very well-established premise for the Islamic Antichrist, which we would be foolish to dismiss! Awesome information, you’ve given me more to study! I agree with you for the most part, I’m still not clear on a few things, but you’ve already answered a lot of my questions. I also agree with you about the temple and whether there needed to be a third one built on one of your other posts. I tell you these are exciting times very sobering prayerful times as well. I am so grateful for people like you and others who God is clearly using in this hour, what a blessing!! Hi UBK, thank you for your comment. The site you’ve linked to is in err, however. Islam and Christianity were not originally the same. Christianity is an extension of Judaism. It is Judaism fulfilled and believes in YHWH the God of Israel, recognizing that the prophesied Messiah of YHWH was and is Yeshua (Jesus), and Him Crucified. Islam, on the other hand, originated from a polytheistic Babylonian religion that made the sun, moon and stars into gods. Mohammed abolished all of the Babylonian gods except for the “moon god”, now commonly referred to as “Allah.” The God of Israel and the god of Babylon are therefore not the same. They are completely different (read more). In an effort to entice Jewish and Christian converts to Islam, Islam’s “prophet” incorporated a twisted mix of Jewish and Christian teachings with the existing Babylonian religion of Arabia early in his campaign to gain adherents to his “new” monotheistic Arab religion (formerly polytheistic), even going so far as to claim that “Allah” was the same god that Jews and Christians worshiped . But Jews and Christians would not be deceived and, already familiar with the polytheistic religion of the Romans and their Greek gods, understood full well that just as abolishing all other Greek gods except Zeus would not suddenly make Zeus the God of Israel, neither would abolishing all Babylonian gods except for the moon god “Allah” suddenly make Mohammed’s god the God of Jews and Christians. This complete rejection of Mohammed and his teachings infuriated the “prophet” of “Allah”, resulting in subsequent “revelations” for the Qur’an for the next 20 or so years that grew increasingly hateful and violent against Jews, Christians and all non-Muslims in general. This twisted mixing of Judeo-Christian teachings, Babylonian paganism and vengeful anti-Semitic and anti-Christian hatred is what permeates virtually every crevice of Islam today. Read more. Historical evidence affirms all of this, UBK, and the Qur’an is little more than a book of lies, half-truths, distortions and plagiarised narratives from the Bible. “Christian” archaeology undermines the Qur’an. “Jewish” archaeology undermines the Qur’an. Even “Islamic” archaeology itself undermines the Qur’an. But when it comes to an ideology whose foundations are grounded in lies and deception, the only facts that need apply are those that can be distorted to undermine the Truth. For your consideration, please take a moment to read through “A Few Simple Questions for Muslim Visitors“. In light of the fact that even Mohammed himself did not know for certain what would happen to him in the afterlife, why should I — or any other Christian who knows beyond a doubt that they are guaranteed eternal life through faith in the Jesus of the Bible — give up the Christian faith of Jesus for the Islamic faith of Mohammed which we know will guarantee us nothing? You, too, can have the same guarantee that we as Christians share. All you have to do is believe in and put your faith and trust in Jesus Christ, and Him crucified. Hi Roger, thank you for your comment. If we aren’t suppose to judge the times in which we live by what we see, then why would Jesus and Paul tell us to watch for events that can be seen? This thesis as well as the Mark of the Beast article and the AC article and some others make so much sense to me and line up so well with what the bible seems to really be teaching that I think it would be foolish to not seriously consider it. It all fits like a glove pretty darn good if you ask me, I have learned a lot. Reblogged this on ~~Defender of Faith~Guardian of Truth~~. I can picture satan possessing the anti-christ and kicking Islam and it’s followers to the curb. Using them like he uses rock stars and then destroying their lives. So he may use their lives to gain power, but once he has power, he may discard them and their system of worship. Very well written. Excellent read. I have been trying to point my loved ones and friends to these facts. I am having to overcome the “Roman Empire” theory. I never really followed politics or presidents at all in my life, but the minute Obama came into the picture back in 2008 I felt something was just really really wrong. I knew how bad Bush was, but I didn’t get that super oddly bad feeling even when Bush was in for a second term. When I looked at Obama, I just had this really bad feeling in my gut that I couldn’t ignore. When he won the election I continually tried to ignore it, but I could not. I had a dream about 13 years ago that I watched a man become elected in office and this man was someone that no one had a clue about. I think I was dreaming about Obama, because we literally knew nothing about him and still don’t since he was elected. His records are sealed, and everything they’ve told us has turned out to be BS about him. Just look at what he is doing. This is the worst president ever. “Perfect human being” “The messiah” “The second coming” the media defends him. unlike Bush, where they drug him through the mud nonstop when he said and did dumb things, the media defends Obama and compares him to Christ to the point where it is sickening. The way he’s trying to take guns away, you’d think they would be calling for him to be impeached. I promise you this, if Bush was doing the things Obama was doing, they would be demonizing him. But Obama is the “Messiah” and “second coming” so they can’t do anything about it. I swear to you, I have had some very disturbing dreams since he was elected. I have seen red skies, and the country torn to pieces in bloodshed of civil war. I have witnessed in these dreams martial law being declared, death camps, all out chaos, and most of all; civil war. If this man is the second coming of anything it is Lucifer. If he is not the antichrist, he is (at the very least) opening the door to reveal him. The expression “the best deceiver” is just the English translation of the original Arabic expression in Quran. Hi Anonymous, thank you for your reply. I have read many Islamic sources, and to say that Allah is “the best deceiver” per Sura 3:54 is the most accurate translation. Most translations of the original Arabic sanitize this verse and, in fact, sanitize much of the Qur’an itself in order to appeal to Western readers. If they were to actually read an accurate translation they would be repulsed and completely offended by the hatred, racism, misogyny and warmongering contained throughout the book. “Some English translations of the Qur’an are simply amazing. At times, they are so far removed from the actual meaning of the Qur’an that they actually say the very opposite of the Arabic original. In this short article I want to point out the mistranslation of one particularly troubling verse. The following transliteration and all translations cited here are taken from this Muslim website. The passage in S. 3:52-55 is important for the discussions between Christians and Muslims because it makes claims about the life and death of Jesus, or rather that he did not die as the Bible reports. In other words, it is a passage that is part of the Qur’an’s denial of the crucifixion of Jesus. The Qur’an claims that what ultimately happened was a scheme or deception devised by God. This has enormous moral and theological implications. Before touching on some of these implications, I want to point out how various Muslim translations deal with this particular passage. Let’s first cite a transliteration and a literal translation of S. 3:54. Note that the above translation is given by a Muslim! First observation: Many Muslim translators render the verb based on the root m-k-r (makaroo, makara) differently when it is used for the unbelievers than when it is used for Allah, despite the fact that it is the same word in both cases, i.e. they use ‘plotted’ vs. ‘planned’ (Al-Hilali & Khan), or ‘plotted and planned’ vs. ‘planned’ (Yusuf Ali), etc. — see the words highlighted in bold. Further observations will be presented below. * Allah: Truthful Or Deceiver? Also see “Deceptions in Islam” and “Deception by Translators of the Quran” for more. You’re both wrong. Jesus already returned in judgement between 66-70AD, and Muhammad plagiarized portions of the Bible and other texts to concoct his counterfeit eachatology. Allah was masqueraded as God, but was described as Satan is described in the Bible: a deceiver. Hello ICA, just stopping by to say hello. Hope all is well with you and yours. The term antichrist in 1 John is only mentioned four times, Islam itself is an antichrist with his sharia law. I do not agree that the antichrist is a manifestation of a person. News about islam always makes me shocked about how a holy “God” is so very bloodthirsty throughout the history of civilization. I am a former Muslim who is enlightened from Indonesia’s largest Muslim country. Luckily I was not from a feral Muslim country like Pakistan, Arab countries or Africa, at least until recently. This site by the way makes me suffer because I think of the persecuted brethren. Thanks for your site, greetings from Indonesian Muslim friendly country (at least until recently). Islam may not worship God as a person as written in the Bible. Muhammad antichrist that he identifies himself as God and revealed through the Quran and the sharia legal system. ICA, I would tend to go with “More Than Just a Man” when talking about the Antichrist. Any doctrine that exalts itself above that of Christ’s is antichrist, which would include all religions and ideologies outside of faith alone in Christ (God was manifested in the flesh 1Timothy 3:16) with no reliance on works/good deeds. Islam and Roman Catholicism foreseen by Daniel. “…A king shall arise, having fierce features, who understands sinister schemes. His power shall be mighty, but not by his own power; he shall destroy fearfully, and shall prosper and thrive; he shall destroy the mighty, and also the holy people. Through his cunning he shall cause deceit to prosper under his hand; and he shall magnify himself in his heart. He shall destroy many in their prosperity. He shall even rise against the Prince of princes; but he shall be broken without human hand.” Daniel 8:23-25. “A king” refers to the institution in general rather than a single person. The prophets commonly signified an entire body of rulers by the analogy of a single person. While many aspects of the above verses describe the nature of both Islam and Roman Catholicism, there is also obviously a distinction between the two; since the former is openly hostile to Christ and easy to recognise as his enemy, and also tends more towards physical killing; whereas the papacy is far more cunning in disguising itself behind Christ’s name, and in the killing of souls, that is, spiritually, by leading men astray from in the word with corrupted interpretations. The “beast” component of the Antichrist refers to religions and institutions that openly work at destroying Christ’s kingdom on earth, that is, Christianity. For example, Islam’s mandate to ultimately subjugate or destroy all other religions out-side of itself (called unbelievers, infidels or kafirs), as commanded in the Koran. And the open enmity and destructive intention of Nazism, Communism, evolutionary indoctrination and atheism, towards Christianity in particular, also make them part of the beast. The “false prophet” component of the Antichrist in the same verse refers to those institutions that disguise themselves behind Christ’s or God’s name and kill souls by subtly leading men astray from the truth of God’s word e.g. Roman Catholicism and Christian cults. Of course underneath it all, both the beast and the false prophet also share some attributes, since they are both working for the same devil.